Mary Corbet is holding a give-away on her website Needle 'n' Thread. She has recently reviewed two Inspirations kits and InspirationsMagazine is providing fabulous prizes; three lucky winners will be randomly drawn and will have her or his pick of the current Inspirations kits. The deadline is early on August 1, 2016. Inspirations kits are known for high-quality materials and thoroughness. Whoever wins will be thrilled. 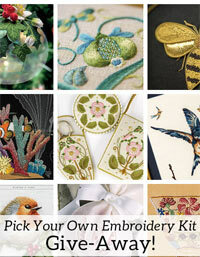 You can read Mary's review of the Chatelaine kit and the Modern Crewel kit on her website.